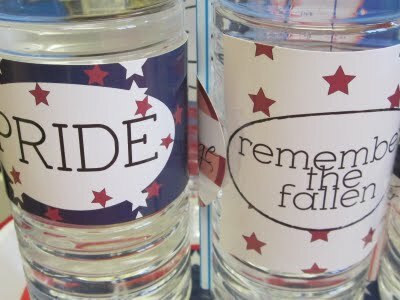 There were some great patriotic printables linked up for the Memorial Day weekend Show and Tell Saturday! they were intended to be used for your Memorial Day weekend, but I think they will work all the way through the 4th of July. 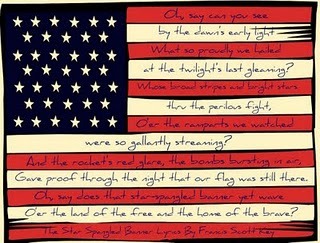 I love the Flag printable from Copy Cat Crafter with the words to the Star Spangled Banner printed on the stripes. This would make a great invitation to your 4th of July barbecue. Homespun with Love shared a party printable set that she that will work for your 4th of July barbecue too. And you can leave this patriotic printable from Measured by the Heart up as a decoration from not through the 4th of July. 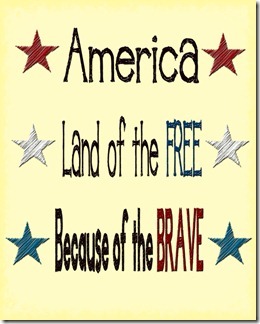 Thanks so much for featuring my flag printable! How very exciting! I'm relativly new to this whole blogging thing so seeing people who's blogs are WAY bigger than mine share my stuff is so awesome!